Banging a tail means to cut it off blunt at the bottom. Traditionally horse's tails were banged to avoid them becoming soiled and straggly at the bottom. Not all horses should have their tails banged. Arabians and Welsh ponies and cobs should have manes and tails left natural. If you are showing in breed shows check to see what the requirements are. If you are headed for the jumper or hunter ring or ride western tails are not generally banged. Horses ridden dressage will often have their tails banged. Again, check the grooming requirements of your sport before proceeding. Also if your horse's tail is on the short side, banging it may only make it look shorter. If you’re a pleasure rider, and not heading to the show ring, there’s no need to bang your horse’s tail, unless of course, you like the look. Banging a tail is not just a matter of chopping it off at the bottom. Before you begin, pay attention to how high your horse carries its tail while it is trotting. Some horses carry their tails quite high, while others keep their tails flatter. You want the cut to be ​parallel to the ground while the horse is moving. If you just chop it off while the horse is standing, when the horse is moving the tail will look uneven. The banged tail should end about 4” (10cm) to 5” (12cm) below the hocks. Any shorter may detract from the look of the tail. 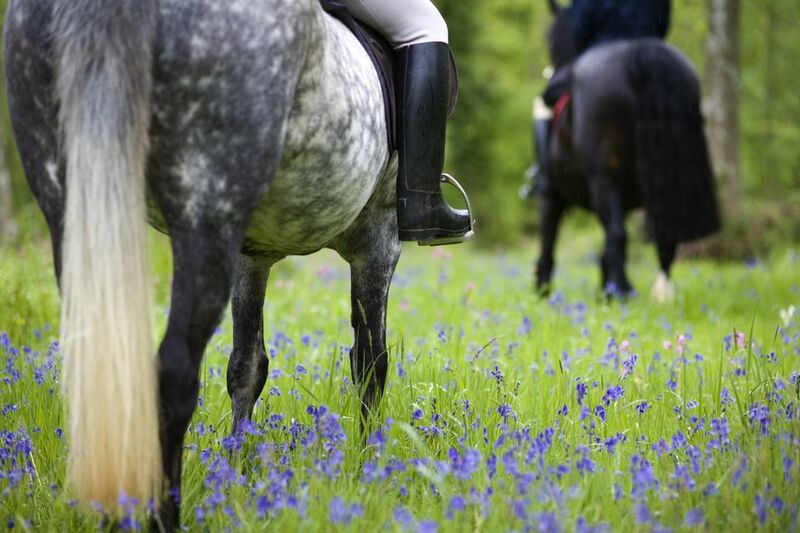 If your horse has a short or skimpy tail, you might want to skip banging it altogether. To get the right length, you can mark the desired cutting line with a little piece of masking tape or a chalk mark before you cut. Better to leave the tail too long, than cut it off too short. Your horse should be accustomed to being groomed and handled and be calm when you work around its hindquarters. Step One: Brush the tail smooth. Don't wet it. Grooming sprays and de-tanglers may make it harder to keep the scissors steady for a straight, clean clip because they make the hair more slippery. Step Two: Have your assistant place the bottle sideways beneath the base of horse's tail so that it lifts the tail more or less into the position it would be if the horse were moving. If your horse isn’t going to squirm, it might be relaxed enough to hold the bottle in place on its own. Alternatively, you could just hold the tail up with your arm, but this is more work, and you could easily move your arm without realizing it. An assistant can be helpful to either cut or hold the tail up. Step Three: Grasp the bottom-most portion of the tail and hold it into a tight bundle. Cut straight across the tail hairs. When the tail is dropped (bottle, tube or arm removed) the cut ends of the tail will be at a slight angle to the ground—the front being slightly shorter than the back. The cut will now be square to the ground when the horse is moving. As your horse’s tail grows, the tail will have to be trimmed again. How often will depend on how quickly the hairs grow.